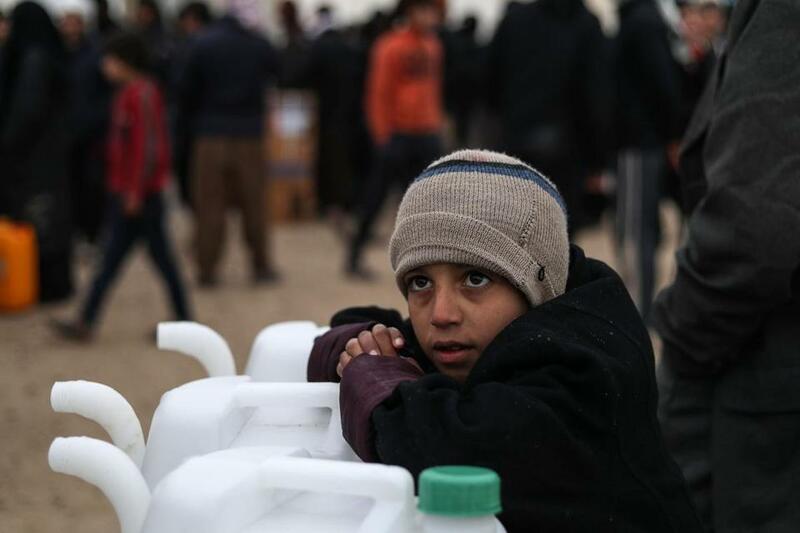 A Syrian boy leaned on new jerry cans as he watche aid items to cope with the winter weather being delivered to the al-Hol refugee camp in al-Hasakeh governorate in northeastern Syria. Winter is rolling into Syria, but many families have no oil or gas to heat their homes. American sanctions prevent almost all trade, including petroleum shipments. They are part of our campaign to inflict pain on Middle Easterners who live under governments we dislike. A recent Treasury Department notice asserts that the United States is determined to “maximize pressure on the Assad regime,” and warns that any company sending petroleum to Syria runs “significant sanctions risk.” The same approach shapes our policy toward Iran. “We must confront the ayatollahs, not coddle them,” Secretary of State Mike Pompeo declared this month. To sharpen that confrontation, the United States has imposed sanctions designed to make life difficult for ordinary Iranians. A foreign policy designed to keep children shivering through the winter is morally dubious at best. It is also strategically unwise. Keeping our Middle East rivals poor, weak, and divided does not serve our interests. The opposite is true. Our safety lies in strengthening states, not weakening them. Only strong states can carry out the counterterror operations that will continue to be necessary after the American military reduces or its presence in the region. American policy toward the Middle East and Afghanistan is frozen into confused immobility. We are torn between two conflicting impulses. Americans are tired of our involvement in seemingly endless wars. Everyone from President Trump to Senator Elizabeth Warren wants to bring troops home. What holds us back — besides the powerful influence of war lobbies in Washington — is fear that ISIS and other terror gangs will re-emerge once we are gone. The best way to resolve this dilemma would be to strengthen every government in the region that is dedicated to fighting those gangs. The Trump administration refuses to do that. Much of the bipartisan foreign policy elite in Washington supports his refusal. Its reasoning is simple. Among the countries most determined to fight groups like ISIS are several that we consider real or potential rivals, most notably Iran and Syria. Strengthening them is our ticket out of the Middle East — but we cannot bring ourselves to do it. Until we break out of that policy prison, we will feel compelled to keep our own armies in the fray. From Central Asia across the Middle East to North Africa, the great twin challenges are defeating terror and stabilizing nations. They go hand in hand. Weak regimes cannot deal effectively with persistent security threats. If we ever want to withdraw from Middle East wars, we will have to leave functioning states behind. Leaders of those states may not like us — or rule the way we would have them rule — but they will serve our greater interest by fighting sectarian extremists. Stability and prosperity on Syria and Iran would not harm our interests nearly as much as sanctions-fixated Washington wants us to believe. The governments of both countries are obsessively dedicated to fighting jihadist terror, which mortally threatens them. We should strengthen them rather than seek to bleed their people. Even if the United States cannot bring itself to cooperate militarily with Iran and Syria, we should at least stop our efforts to weaken their societies. Sanctions punish masses of innocent civilians and keep countries in upheaval. This is not a good long-term investment for the United States. Governments come and go, but nations carry memories with them over generations. As long as people in Middle Eastern countries are wretched, some will grow into violent radicals. If they conclude that United States sanctions are the reason they cannot heat their homes or buy medicine or rebuild their destroyed towns, their radicalism will naturally become anti-American. State power remains humanity’s greatest guarantor of order. Even bad regimes provide more stability than anarchy does. The family that rules Saudi Arabia, for example, is harshly repressive and wages brutal war. Yet if somehow the family was suddenly overthrown and all the princes forced to flee, Saudi Arabia might dissolve into something far worse. Vladimir Putin is no model of benevolent rule, but would we want Russia to splinter instead and run the risk of a dozen Chechnya-style wars across the vast expanse of North Asia? Some would say yes. After all, weakening your enemies sounds like a sensible strategy. More than a few geo-politicians in Washington would cackle in glee to see Russia — or China or Iran or Cuba — explode into violent turmoil. They would be mistaken. Today, foreign powers are not the principal threat to the United States. The dangers they pose are manageable. More deeply threatening are currents of violent terror that will continue to swirl across the Middle East and other regions for years to come. We are deploying troops around the world to confront that threat. If we ever hope to bring those troops home, we have to leave coherent governments behind. Sometimes weakening unfriendly countries is in the national interest. In today’s Middle East it is not. Our overriding need there is to control terror groups. Only strong states can do that. We should be seeking to stabilize countries, not destabilize them. That would serve our national interest while keeping Syrians warm this winter.